The Monogram Wood Keychain from Dimensions includes two personalization choices: a single initial or a three-letter monogram. Finished size: 1" x 2". 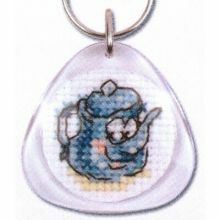 Counted cross stitch kit includes: Wood keychain with split ring • Thread • Needle • Instructions with alphabet..
A great gadget in the form of a small pendant with a lovely teapot. Kit contains: Aida fabric 14", white, needle, thread, pattern, instructions and plastic pendant ready to latch onto the fabric and the circle of keys. ..